Being raised in an Italian home, it was nothing for my mom to go through gallons of extra virgin olive oil. It was just a daily dosing of one of the best tasting staples in our home. We used it on hot Italian bread, right out of the oven. 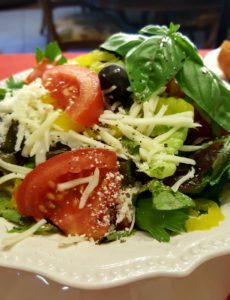 Over our Italian salad, all complete with the best imported olives anyone could afford. We used it to flavor our pastas, casseroles, vegetables, and we even pan-fried our best meats in its luxury. Later, in my growing up years, I learned how beneficial the Mediterranean diet was, and how extra virgin olive oil played a great part in that cuisine. Olive Oil Is Rich in Healthy Monounsaturated Fats. Olive oil, especially the extra virgin, is rich in the fatty fruit of the olive tree. About 24% of the oil is saturated fats and omega-6 and omega-3 fatty acids. But 73% fatty acid in olive oil is a monounsaturated fat called oleic acid, which is extremely healthy. Bottom Line: Olive oil is rich in monounsaturated oleic acid, which is extremely healthy. This fatty acid is believed to have many beneficial effects, one of which REDUCES INFLAMATION and may have beneficial effects on genes linked to cancer. 2. Olive Oil Contains Large Amounts of Antioxidants. Apart from its beneficial fatty acids, it contains modest amounts of Vitamins E and K. It is also loaded with powerful antioxidants. This includes antioxidants that can fight inflammation and help prevent the cholesterol in our blood from becoming oxidized, both crucial steps in the heart disease process. Bottom Line: Extra virgin olive oil is loaded with ANTIOXIDANTS, some of which have powerful biological effects. Olive Oil Has Strong Anti-Inflammatory Properties. Chronic inflammation is thought to be among the leading drivers of many diseases. This includes cancer, cardiovascular disease, metabolic syndrome, diabetes, Alzheimer’s, arthritis and even obesity. Some scientists estimate that the oleocanthal in 50 ml of extra virgin olive oil has a similar effectiveness as 10% of the adult dosage of ibuprofen. There are also studies suggesting that oleic acid itself, the main fatty acid in olive oil, has a similar effectiveness as 10/% of the adult dosage of ibuprofen. Bottom Line: Olive oil contains nutrients that can FIGHT INFLAMMATION. This includes OLEIC ACID, as well as the antioxidant, OLEOCANTHAL. OLIVE OIL MAY HELP REVENT STROKES. Stroke is caused by a disturbance of blood flow to the brain, either due to a blood clot or bleeding. The relationship between olive oil and the risk of stroke has been studied extensively. A large review study that included over 841,000 subjects found that olive oil was the only source of monounsaturated fat associated with a reduced risk of stroke and heart disease. These findings are supported by another large review study, this one with 140,000 participants. Researchers found that those who consumed olive oil were at a much lower risk of stroke. Bottom Line: Consuming Olive Oil has a much LOWER RISK of developing STROKE, the second biggest killer in developed countries. Olive Oil Is Protective Against Heart Disease. Heart disease is the most common cause of death in the world. Observational studies conducted a few decades ago showed that heart disease was rare around the Mediterranean Sea. Some benefits: It lowers inflammation, protects LDL cholesterol from oxidation, improves the function of the lining of the blood vessels, and may help prevent unwanted blood clotting. Bottom Line: Olive oil has numerous benefits for Heart Health. It lowers blood pressure, protects LDL particles from oxidation and has beneficial effects on many other risk factors. Olive Oil Does Not Cause Weight Gain and Obesity. A high intake of olive oil is not linked with weight gain or obesity in observational studies. A 3-year study in 187 participants found that a diet rich in olive oil increased levels of antioxidants in the blood and caused weight loss. Bottom Line: Consuming large amounts of olive oil does not appear to increase the likelihood of weight gain. It may even be BENEFICIAL for WEIGHT LOSS. Olive Oil May Help Fight Alzheimer’s Disease. Alzheimer’s disease is the most common neurodegenerative disease in the world. One of its key features is a buildup of so-called beta amyloid plaque inside brain cells. Studies show that a substance in olive oil can help remove theses plaques from brain cells. Bottom Line: Some studies suggest that olive oil can help FIGHT ALZHEIMER’S disease, but more research is needed to confirm this. Bottom Line: Both observational studies and clinical trial suggest that olive oil, combined with a Mediterranean diet can REDUCE the RISK of developing TYPE 2 DIABETES. The Antioxidants in Olive Oil Have Anti-Cancer Properties. Cancer is on of the most common causes of death in the world. People in Mediterranean countries have a lower risk of some cancers, and many researchers believe that olive oil may have something to do with it. The antioxidants in olive oil can reduce oxidative damage due to free radicals, which is believed to be one of the leading drivers of cancer. Many test tube studies have shown that compounds in olive oil can help fight cancer cells. Whether olive oil can help to prevent cancer needs to be studied properly in humans. Bottom Line: There is preliminary evidence that olive oil may help PREVENT CANCER, but this needs to be studied properly. Olive Oil Can Help Treat Rheumatoid Arthritis. Rheumatoid arthritis is an autoimmune disease characterized by deformed and painful joints. Olive oil supplementation appears to improve inflammatory markers and reduce oxidative stress in individuals with rheumatoid arthritis. Olive oil appears to be particularly beneficial when combined with fish oil, a source of anti-inflammatory omega-3 fatty acids. Bottom Line: Olive Oil can help JOINT PAIN and SWELLING from rheumatoid arthritis. The beneficial effects are greatly increased when combined with fish oil. Olive Oil Has Anti-Bacterial Properties. Olive oil contains many nutrients that can inhibit or kill harmful bacteria. One of these is Helicobacter pylori, bacteria that lives in the stomach and can cause stomach ulcers and stomach cancer. A study in humans showed that 30 grams of extra virgin olive oil can eliminate Helicobacter pylori infection in 10-40% of people in as little as 2 weeks. Bottom Line: Extra Virgin olive oil has ANTI-BACTERIAL PROPERTIES and has been shown to be particularly effective against Helicobacter pylori, a type of bacteria that can cause stomach ulcers and stomach cancer. Final Note: Extra Virgin Olive Oil is the only type of olive oil that contains all the antioxidants and bioactive compounds. It is the only olive oil recommended for better health. IMPORTANT: Read the labels, and make sure the olive oil has not been diluted with other refined oils.